This small original oil on canvas Rubythroat Hummingbird is looking for it’s new home! If you are looking to add to your collection, try this bejeweled little guy to add that much needed spark. Ruby Throat Hummingbirds are funny fast little creatures that will warm their way into your heart for years to come. Add interest to your room with this bright, tiny rubythroat hummingbird as it perches politely on a sprig of geraniums. This fun colorful animal will bring personality to your room. 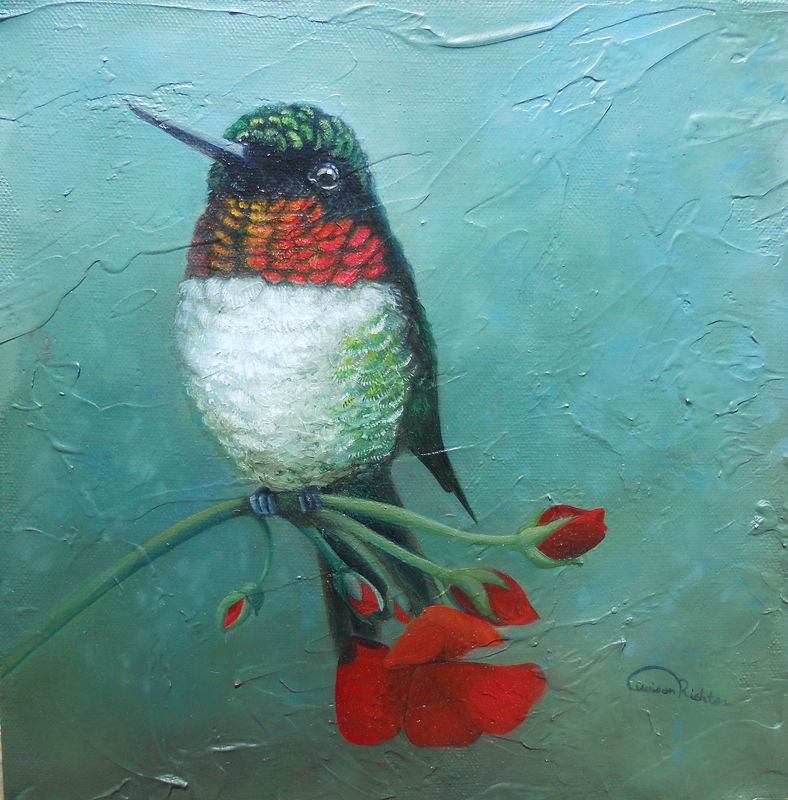 This original wildlife artwork shows a rubythroat hummingbird sitting on a geranium perch. Enjoy hues of pink, red, yellow, blue and green with this small original square artwork h 10″ x w 10″ that compliments your chosen decor. Whether just starting your art collection or looking to add a new beauty to your your current collection, the “In Tune” one-of-a-kind artist signed original is available to purchase below. Appreciate this artist crafted, detailed, oil on canvas original artwork in your own home. “In Tune” brings an incomparable charm that can bring some of the elements of nature indoors. Whether adding a sense of escape to the office, enriching the home, or adding some extra flavor to that special vacation retreat, your new artist signed giclee can even more life to your interior space.